The sheer beauty of autumn is why you chose this wonderful season, and autumn's grace is elegantly captured in these fall wedding invitations. 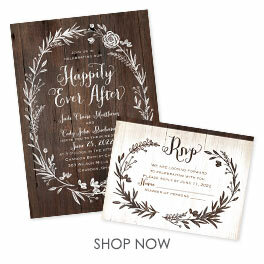 The leaf designs accompanying your wording are filled with an elegant filigree pattern. The z-fold style offers plenty of room for design and wording. Your names appear on the front panel, your wedding details on the middle panel and your choice of wording on the third panel (reception wording shown; matching reception cards also available). Design and wording are printed in your choice of colors and fonts. Invitation includes inner and outer envelopes. These fall wedding invitations are printed on bright white paper and feature thermography printing, an affordable printing process that results in raised lettering.